Marketing is important to stay competitive in the market. Apart from all types of marketing, digital marketing has a proven track record of driving any organization’s success. When it comes to digital marketing, video marketing is at the forefront and has turned up as an easy and faster way to improve conversions. Video marketing is a broader pool of different types of videos, for example, whiteboard videos, character animation, motion graphics, stop actions, live action, etc. Each type of video has its technicalities that every digital marketer needs to take care of during digital marketing campaigns. You are highly fortunate in the world of marketing if you have an aligned budget, especially for video marketing or hiring any video marketing company. What if you are not able to hire any marketing company but want to make videos to improve your brand presence? Don’t worry; I am here to help you out by providing unbeatable video marketing solutions. I am talking about video software programs that have helped a number of startups and SMBs make a video in just a few hours. It’s surprisingly easy to make videos on your own no matter how much complex your idea is. Let’s discuss some of the best software available to make videos without hiring any experts. 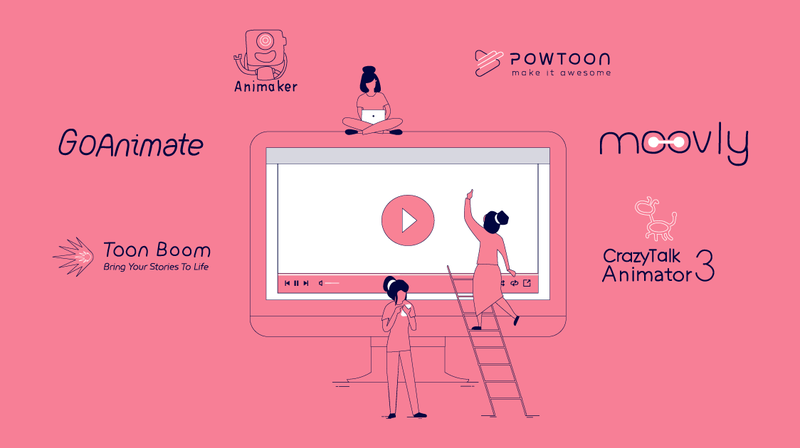 If you do not hold hands-on experience in animation, then this tool is a good option for you. As it gives you great ease of access, you will be able to develop animated videos as per your requirements. After selecting the right template, you can customize it by adding text, media, other transitions to uplift the actual essence of an explainer video. If you want to engage, teach, and interact with your prospects, this tool can be a great helper. You can grab the attention of every single audience using this tool as it helps you make engaging videos. Want to add liveliness to the texts, word balloons, or characters? MotionArtist is mainly designed for videos enthusiasts who can easily create motion comics using the tools provided by this software. This explainer video software comes with some of the best features as you get more than 500 icons to choose from, select the hotspot size, color, visibility, text, etc. CrazyTalk Animator comes for free. Its trial versions offer 3 x fully functional PSD project and G3 Character human template. It is an engaging and fun animated explainer video maker with several pre-animated sets that come for free. The software works well if you aim at the highest creativity and ROI. Tell your story using a range of pre-animated characters, props, and backgrounds. Edit pre-animated characters and sets according to your business requirements. As marketing creations have become advanced, the video marketing platform is attaining greater heights. Videos can be of any types. It can be introductory videos related to your company or how-to videos, webinars or live videos, training videos or product-related videos, etc. You can improve your conversion rate up to 80% by adding a right video to the landing page. Explainer videos are a great way to market one’s services to a wider audience. If the visual impact of a video is compelling, you are likely to convince your audience to click CTAs or make a decision for purchase. The explainer video software mentioned above can give a pitch to the business you have always wanted. You don’t need to have strong technical acumen for video marketing as these software programs come with lots of templates and other features that help you make engaging videos and grab a more significant chunk of the audience.